I started blogging about three years ago with zero knowledge of photography. Like every newbie I started with my phone. I had a digital camera but was not confident enough to use it. However, once I got hold of it, it completely changed the game. I am still not professionally trained in this department. Just a beginner trying every possible thing to make my blog photos stand out. I am going to list few basic steps down below if you are new to blog photography and want to work on your photography skills. But before that let me make this very clear, that I don’t own any fancy equipment or to be very precise no photography equipment at all. I only have one eight years old Olympus SP-570UZ digital camera. Let’s get started. Important step is to know your camera. Check all the options it has and experiment with it. Once you are familiar with it you can change settings according to your choice. My camera is set most of the time on Auto mode. But playing with different other modes of your camera can make you understand better about its performance. I don’t own any lighting equipment. I take all my photos in natural light. But I don’t take pictures in direct sunlight. Harsh sunlight makes photos overexposed and wash out the colours. I also prefer cloudy day for photography. Because clouds act like a soft box, minimising shadows. Here cloudy day doesn’t mean grey weather, although I took photos for this blog on very dull and gloomy day. But I placed my table right in front of window to utilise the maximum available light. When it comes to beauty products you want swatches to be as true to real colours as possible. I prefer early morning light which is cool white and soft. Afternoon light is also suitable if you are not too much concern about the slight colour distortion. Afternoon light adds warmth to the photo. For self-portrait I stand in front of window keeping three-four feet distance. It helps in capturing every detail and crisp photos without any reflection or bouncing of light. Clean background pops the product better and don’t take the spotlight from the object which you want to photograph. White and marble effect backgrounds are fool proof choices. However, any subtle colour works better. You can add patterns in the background and some texture as well. But make sure they are not distracting. I find plain white background a bit boring and cold. I love to add few accessories as a backdrop to give a little character to the photo. A little greenery, small fairy lights, a burning candle or fresh flowers can bring the picture to life. The choices are unlimited but always remember that less is more in this case. Don’t overwhelm the background and clutter it with too many props. In beauty products photography, unfortunately the editing options are minimal. Too much editing and you can change the undertone of lipstick/eyeshadow/foundation. If you are beginner, don’t go for complicated software like Adobe Photoshop. I use the Photoshop Express. It is free to download. It has all the basic editing tools like cropping and colour correction with few filters if you want to be creative for Instagram or Pinterest. 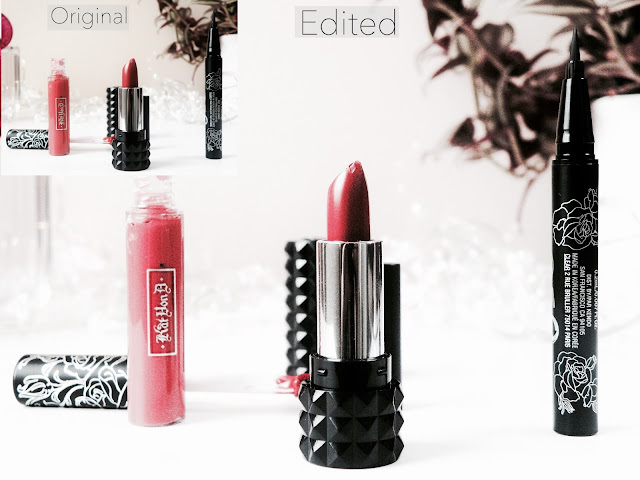 I don’t apply filters on my photos when they are specifically beauty products for blog reviews. It almost kills the purpose of whole exercise. To make photos crisp and sharp play with brightness, contrast and highlight. Any digital camera on auto mode captures photo in 50% grey scale. White looks dull and black looks slightly grey tone. This can easily be fix by increasing and decreasing brightness and contrast using editing software. Example is below. Super macro mode is my favourite mode to take pictures. Super macro is symbolised with a small flower. With this mode on, you can take super close up photos, focusing on the specific part of object while blurring the background. I capture all those photos where I want to capture the detail with super macro mode on, like focusing on lipstick bullet or taking a photo of jewellery item. It captures every tiny detail and photos look very professional and high quality. In the example picture below you can see that when I tried to take a close up picture of applicator, it got blur and my camera focused somewhere else. 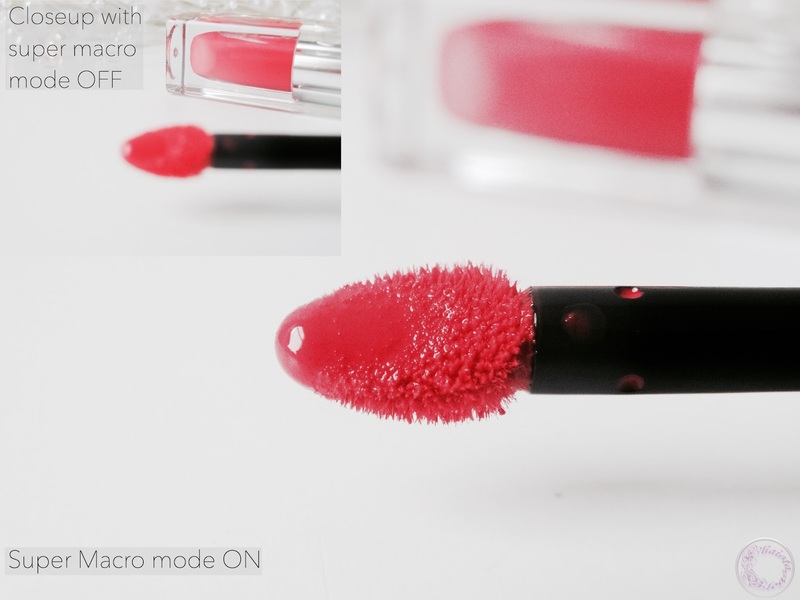 With Super Macro mode on, camera automatically focused on applicator which was the nearest object to the lens. Other than these basic tips, play with angles. Take pictures from every possible angle to get a good view. Also don’t rush unless you are absolutely sure that you have a nice collection of photos. Take as much photos as possible and then pick four or five for your blog. If you can, dedicate a small area in your room for this purpose. I don’t have enough space in my room for photography setup, that’s why I have to pack everything after the session and setup a whole area before session which sometime is a mood killer. 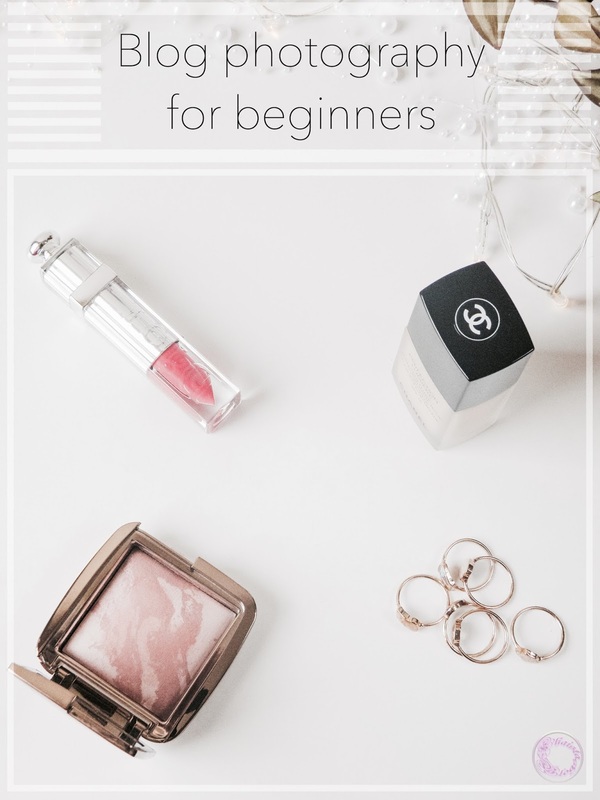 These are all the basic tips I can give to any beginner. You don’t need full setup to get decent photos. With little effort and creativity anyone can achieve stunning results. This is a really great post. I am stuck on using my camera phone for now but would love a proper camera. What would you recommend for a newbie? I heard good things about Olympus Pen. It is compact camera but performs like proper DSLR with all the lens change etc. Fab post. Thanks for sharing these tips. Your photography is beautiful. I hope these tips help you as well. Some very useful tips - especially the one about clean backgrounds! 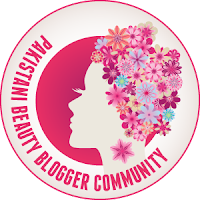 Great post dear.You have shared some very useful tips that can help anyone who wants to improve photography for the blog. Thanks for sharing. Your photographs always look so clear and crisp, thanks for sharing your tips. Great post - I've recently been loving photography a lot more, and therefore will be bookmarking this page! Zabardast! Thanks for putting up this post, enjoyed reading and adding on to my own knowldge.